Warm a large nonstick skillet coated with cooking spray over medium-high heat. Add steak and brown on both sides. In a small bowl, combine tomato sauce, water, Worcestershire sauce, onion, salt, pepper, oregano, and parsley; mix well. 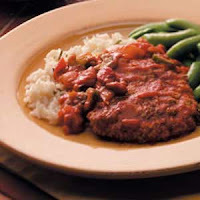 Pour over meat in skillet, cover, and simmer for 30 minutes or until meat is tender. Gently stir in peas and cook an additional 2 to 3 minutes until peas are thoroughly heated. Making your own sausage allows you to choose the freshest ingredients available and to avoid the use of nitrates and refined ingredients. Choose the sausage you want to make. Sprinkle the seasonings over the ground meat. 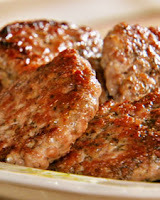 Make into patties, a meatloaf or stuff into sausage casings by hand or with a sausage horn. Refrigerate in airtight containers for 2 or 3 days to allow flavors to blend. Loaf: Set loaf pan in another pan of hot water in oven. Bake at 350° for 1 1/2 hours or until meat thermometer reaches 160°. Patties: Fry until golden brown. Rolls or links: Cover with water in fry pan. Simmer for 20 to 30 minutes. Drain water and dry until golden brown. Your sausage will only be good for 2-3 days in the refrigerator. If not using immediately, freeze for up to 2 months. ADD, Arthritis, Autism, Auto Immune disease, Candidiasis, Fatigue, Fibromialga, Food Allergies, Inflammation, Joint Pain, Lupus, Muscle Aches, PMS, Psoriasis, Rheumatoid Arthritis, and Yeast Infections. All recipes are (a) free of refined sugar and refined grains of any kind, (b) free of yeast, mold and fermented foods, and (c) absolutely delicious. Most of our recipes are wheat free, dairy free, gluten free, and casein free as well. In addition, you will find many “egg free” and “vegetarian” recipes, and you will learn handy substitutions that you can use to convert other recipes to allergen-free along with substitutions for wheat and other grains, dairy, eggs, yeast, vinegar and more. YeastFreeMeals.com. Awesome Inc. theme. Powered by Blogger.